Early in the last century, thousands of mill houses sprung up around St Peter’s Cathedral. ‘Mill schools’ educated the area’s huge numbers of children in places like Balkan Street, Raglan Street, and Slate Street. Canavan Memorial School in Milford Street had former Antrim Gaelic footballer Jack Miles on its staff. Eager to promote health and fitness, Miles formed a GAA team in 1931. The ‘foreign games’ debate raged among local Gaelic and soccer players at the time, but Miles’ team had the dispute settled for them – and Belfast Celtic reaped the rewards! On their first outing, they were battered 40 points to zero by local rivals St Finians! Schoolmaster Miles quickly learned his lesson. Soccer was a better option for his fledgling outfit. Entering the Irish Schools Football Association, they joined the Senior League’s Section B and by Christmas they’d won 9 out of 10 games ahead of the Schools Cup competition, where they felled all comers and defeated Mountcollyer 2-1 in the semis for a final place against Coleraine’s Irish Society School. (left-right): Back Row H Quinn, Jack Miles, M Hamill. Second Row Patsy Drain, John Monaghan, Tommy McKinney, John Fitzpatrick, Jackie Quinn.Third Row Phil ‘Chic’ Daly, Eddie Smyth, Jimmy McAlinden, Bobby McAuley (Capt. ), Bobby McFarland (Vice-Capt. ), Tommy ‘Nitsy’ Clarke. Front Patsy Robb (reserve) Picture courtesy of Marie Osbourne. With honours even at half time, Jack Miles settled his team, reassuring them that, despite physical disadvantage, they were the better side. They re-entered the fray with renewed determination and Jimmy McAlinden fired home three more goals, with ‘Nitsy’ burying one to finish the rout 5-1 to Milford Street. The Bannsiders had taken a footballing lesson from the Falls Road school team! ‘Nitsy’ and his team were carried shoulder high back to the school, where it seemed; “The whole of the Falls must have been at the match”. After fish and chips at Raffo’s and ice cream at Victors in Bath Street, they got the winners’ cup. 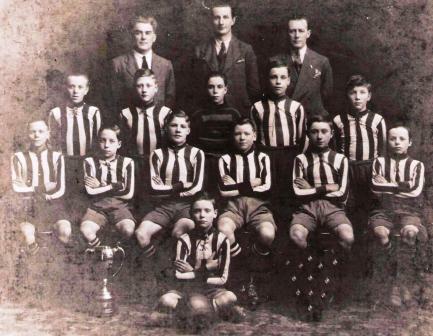 No medals were given, but Belfast Celtic stepped in and presented each player with a gold medal, mounted on the plaque, visible in the team picture. Always quick to grab talent, Belfast Celtic later signed every player from the team - Gaelic football’s loss was the Belfast Hoops’ gain! Jimmy McAlinden, from Lady Street, would have a medal laden career, scoring in the Irish Cup winning final of 1938 for Belfast Celtic and lifting the FA Cup at Wembley in 1939, after his transfer to Portsmouth for £7,500. As a manager, he had decorated spells at Glenavon, Drogheda United and Distillery, where he returned to Grosvenor Park to coach another young GAA convert, Martin O’Neill, to a 1971 Irish Cup win. The Milford Street School team, which gave him his first glimpse of glory, lives on in Falls Road folklore and Jack Miles can be proud of his decision to pursue soccer as a path to success. The Belfast Celtic Museum at the Park Centre will open on Saturday, August 7 from 12noon to 5.00pm.